Need a day laborer? There’s an app for that. 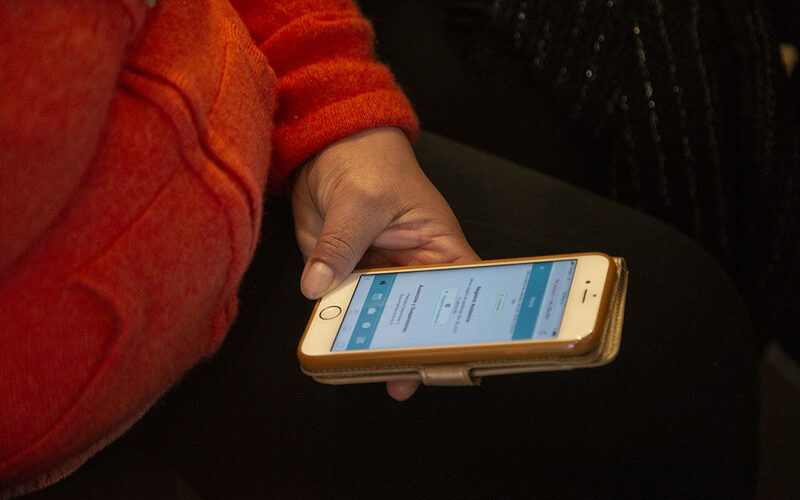 Informally called “La App” by program members, the new mobile phone app for the Day Labor Program and La Colectiva would make it easier for day workers to find jobs, connect with employers and track their wages and membership dues, among other things. Photo by Abraham Rodriguez. It’s San Francisco in 2018 and, very soon, you’ll be able to hire a day laborer by using an app. The San Francisco Day Labor Program and its sister organization, La Colectiva, are stepping into the software arena with an app it unveiled over the weekend at a tech fair held at its Cesar Chavez Street offices. The idea, says Day Labor Program Director Antonio Aguilar, is to provide a fair alternative to platforms like Taskrabbit and Takl, where rates and prices are set by a company rather than the collective group. 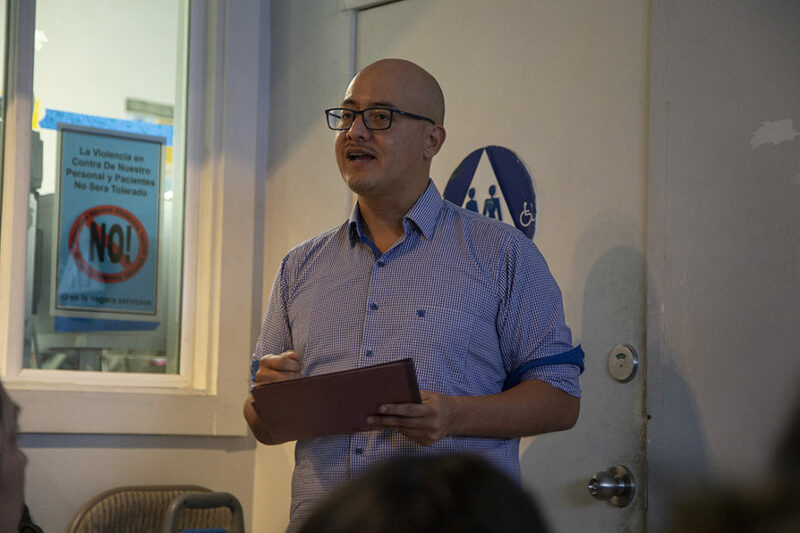 This way, Aguilar said, workers who have been using the gig-like method to promote their services can have greater control. But it also brings workers who have usually waited out on street corners and other pick-up locations into the digital realm. The ideas for the as-yet-unnamed app coalesced at a 2016 hackathon after members of La Colectiva, which specializes in house- and office-cleaning services, made a presentation about their work. Eventually, the organization was connected with a group of five PayPal employees, who helped them develop a new mobile platform. Development took two years to complete, Aguilar said. Day Labor Program and La Colectiva Director Antonio Aguilar unveiling the new app at Saturday’s Tech Fair. Photo by Abraham Rodriguez. While it’s still in its testing stages, once the app is fleshed out and launched in the coming months, it will allow the two organizations to seamlessly dispatch members to job sites. Workers should be able to handle most of their activities — including reporting an abusive employer — through their phone. Both organizations currently use the same 20th-century dispatch system to assign jobs to workers who check in every morning: Employers can call in and put in a job request, which is then processed by office employees. Those same employees then call members of La Colectiva or the Day Laborer Program who have checked in that morning. The app-to-be will connect employers with day workers far more efficiently, and also be able to handle far more requests than the offices can presently process. 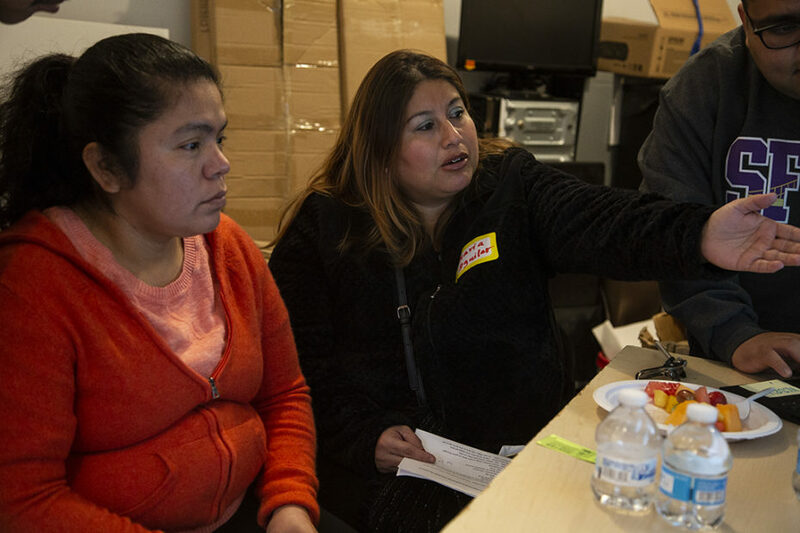 Day Labor Program and La Colectiva dispatchers currently have trouble keeping up with demand. The app will also allow workers to access their profiles, check their work history and payments, file complaints against employers in case of wage theft, and check their monthly dues. Both organizations offer advocacy services, and those can be requested through the app as well. Until then, the next steps for Aguilar and crew are to get their members trained and comfortable with the app before opening it up to employers. Mayra Alfaro was one of the members who took an early training course at Saturday’s fair. She liked the idea that the training would let her see who’s working and who’s not, and to avoid any confusion or overlap. “There’s a lot of us who don’t know much about technology. This launch is helping us modernize and get up to par with everyone else,” she said. Maria Aguilar, left, showing Mayra Alfaro, right, how to operate the web app for La Colectiva. Photo by Abraham Rodriguez. There is the potential, Aguilar said, of sharing the software with other members of the National Day Laborer Organizing Network, which both Mission programs are part of. There are still challenges, however — such as getting members trained and comfortable using the app in the first place. For now, there’s still work to be done. Gabe Dominguez, a volunteer programmer who is helping to perfect the app, said it’s his job to craft the “production ready” version for distribution. Both the mobile app and the systems in the home office need to be integrated, so both can show the same information and can be accessed by all members, he said. But hope and the sense of something new is palpable among many members, like Maria Aguilar, who usually organizes La Colectiva’s theater troupe, and welcomes a modern addition to her work. “There’s a lot of need for accountability, and we always have questions. At least with the app, we’ll be able to get something taken care of quickly,” she said. How is Worker’s Comp handled through the service? Payroll taxes? To hire a legal worker (legal in the sense of labor law, not immigration status) making $17 an hour I have to pay closer to $30 per hour.